Store the complete kit at 2 8°C. Under these conditions, the kit is stable until the expiration date (see label on the box). Cyclophilins belong to a group of proteins that have peptidyl-prolyl cis-trans isomerase activity. Such proteins are collectively known as immunophilins and are found in all cells of all organisms studied, in both prokaryotes and eukaryotes; humans have a total of 16 cyclophilin proteins. All cyclophilins share a common domain of approximately 109 amino acids, the cyclophilin-like domain (CLD), surrounded by domains unique to each member of the family that are associated with subcellular compartmentalization and functional specialization. Cyclophilin F (PPIF, Peptidyl-prolyl cis-trans isomerase, CypF, CypD) has a signal sequence that directs it to the mitochondria, and thus, is involved in mitochondrial metabolism and apoptosis, as well as in mitochondrial diseases and related conditions, including cardiac diseases, neurodegenerative diseases, and muscular dystrophy. Particulary, cyclophilin F has been found to play an important role in the mitochondrial apoptosis as a major component of mitochondrial permeability transition (MPT). MPT is a phenomenon induced by high levels of matrix calcium and is characterized by the opening of mitochondrial PT pores (MPTP). This activation results in mitochondrial swelling, increasing reactive oxygen species (ROS) levels, membrane depolarization, failing ATP production, caspase cascade activation and ultimately apoptosis. By generating CypD-deficient mice, several research groups have discovered that CypD and mitochondrial permeability transition (MPT) are required to mediate the cell death induced by calcium and oxidative damage, but not to mediate conventional apoptosis involving Bcl-2 family proteins. Another animal model study has shown that deletion of the gene encoding CypD reduce myofiber necrosis in two distinct models of muscular dystrophy, leading to suggestion, that inhibition of cyclophilin D could provide a new pharmacologic treatment strategy for these disease. In addition, CypD-deficient mice showed a high level of resistance to ischemia/reperfusion-induced cardiac injury. 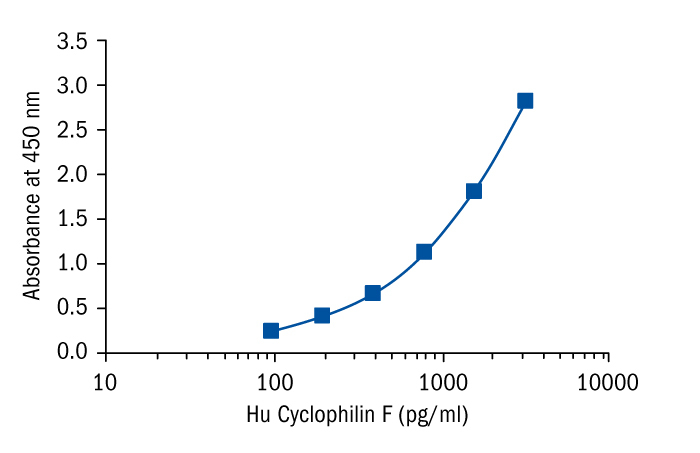 As a member of cyclophilin family, CypF binds the immunosuppressive drug cyclosporine A (CsA) to form a CsA-Cyp complex, which than targets calcineurin to inhibit the signaling pathway for T-cell activation. Due to its association with the MPT, CypF is also involved in neurodegenerative diseases, including glaucoma, diabetic retinopathy, Parkinson disease and Alzheimer disease.